I think that sidewalk chalk is easily one of our most used art supplies. We go through a lot of chalk. My boys particularly enjoy playing hopscotch. We have done xylophone hopscotch before and it was a hit. As was the giant chalk keyboard. So I figured that we could do a hopscotch game to explore a space theme. Since J can read and K is already reading plenty of words by sight, I decided to focus on introducing the names and order of the planets. However, you could easily just make a rocket-shaped hopscotch with numbers instead. 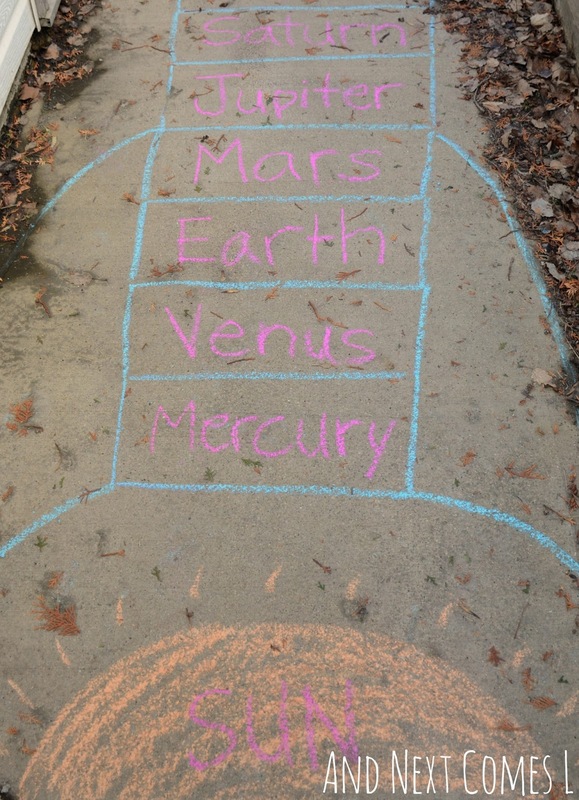 I drew a giant rocket out of sidewalk chalk and wrote the names of the planets in order from closet to the sun to farthest from the sun. I also drew a sun and labeled it. K was the first to try it out. I simply called out the planet names as he hopped on them. When J joined in, he was curious about the sun. "Oh, look! A sun, mom!" Then J decided that the rocket hopscotch needed some numbers just like regular hopscotch. So he grabbed a piece of sidewalk chalk and started counting and labeling each planet. 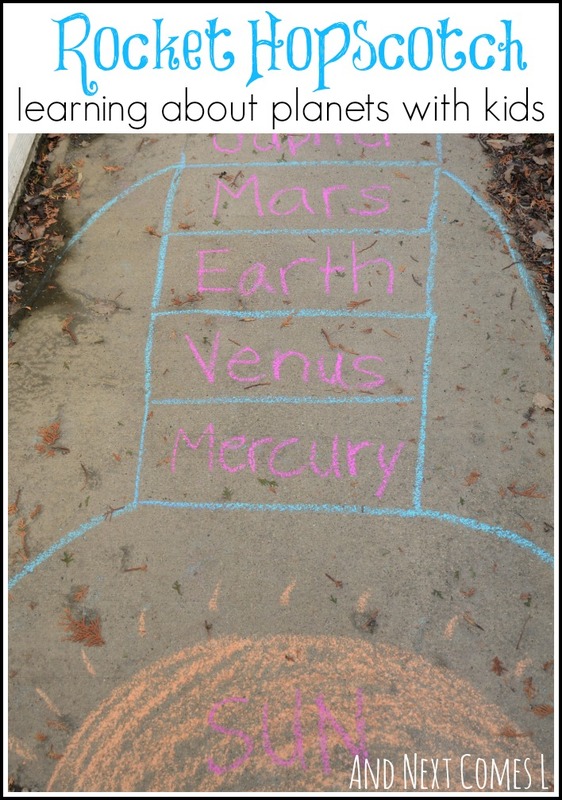 It was a great way for him to practice some writing, but it also reinforced the order of the planets and how many planets there are in our solar system. K joined in, attempting to write some numbers of his own. From there we did some imaginary play by standing on the rocket, counting backwards from ten, and saying, "Blast off!" Looking for more space themed ideas? Check out our tin can and Magna-Tiles rockets and our constellations light table play. Then browse my Space Theme board on Pinterest for even more ideas.